One thing that is extremely important to me when I run is the music playing in my ears. It boosts my mood and keeps me going, providing motivation when necessary as well! I have a variety of playlists–one for running outside, one for the treadmill, one for shorter runs, one for morning running, a Bollywood playlist, one for Christmastime, etc. It all depends on what kind of mood I’m in and what I need to motivate me at that particular time. I often find myself making new playlists just because I get bored with the old ones. I’ve already started working on my playlist for marathon day (April 13th–so close! ), but I promised myself that I would not listen to it until the actual race. It maintains some element of surprise that will keep things interesting! There are several songs, however, that tend to make an appearance on most of my running playlists, and that’s what I want to share with you today. Some of these songs inspire me to run harder, some of them have a good beat to keep me energized, and some just make me happy. I hope you’ll find some new songs on this list that you enjoy! What are some of your running playlist “must haves”? 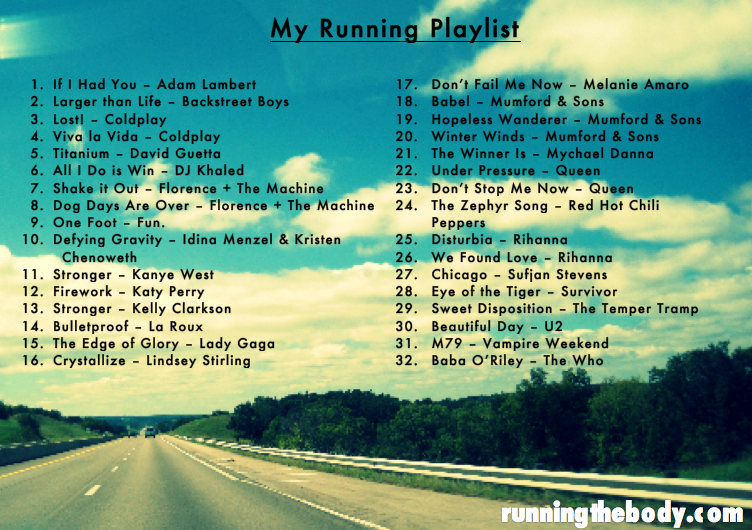 Do you have a favorite running song? This entry was posted in Fitness, Healthy, Misc, Running, Uncategorized and tagged fitness, healthy, inspire, inspiring, marathon, motivation, music, playlist, run, running, songs, train, training. Bookmark the permalink. Awesome list! Deadmau5 has become a major staple in my running playlists but I’m also a big EDM junkie. Anything by Swedish House Mafia, Passion Pit, No Doubt, Tiesto, Coldplay, and Youngblood Hawke are amazing as well. I really need to listen to more Deadmau5! You’ve mentioned some of your running music before and I think it would help revamp my playlists to add some new stuff. Let me know what songs you recommend. And I felt the same way when I was typing up these songs–can’t wait for my next run! My playlist for the gym is getting a little long and I really need to make another one but it has mostly upbeat songs from artists like Lady Gaga, Kelly Clarkson, Rhianna, etc. We have #28 in common, I always giggle when that song comes on for some reason. This is kinda late but I always like running to Remember the Name by Fort Minor 🙂 It just gets me so pumped!